British company McLear is launching its latest piece of connected jewelry, with contactless payments resting at the heart of the operation. The same team behind the crowdfunded NFC Ring smart ring is launching the McLear smart ring, a wearable that foregoes fitness and wellbeing tracking (unlike the Motiv Ring or the Oura Ring) and instead offers the same contactless payment tech packed into contactless cards and other payment-enabled devices. Once you've paired the ring with the companion app (iOS or Android), it assigns a secure isolated bank account that sits between any of your cards (Visa and Mastercard for now, with Amex to be added). Setting up that account requires taking a picture of a form of identification, such as your driving license or passport to verify the account. Once you're verified, McLear says that information is deleted and not stored anywhere. Once you're all set up, you'll need to perform a closed-fist gesture and raise the ring towards a contactless terminal to make a payment. There's a £30 limit, like you get with most contactless payment devices, but the company is working to remove that restriction. There is also a 1% fee each time money is loaded onto the account (not on each transaction), but, again, it's looking to remove this. From the companion app, you can see a history of your spending, including the number of times you've visited an establishment, along with average spend and your net spend over the last 15 days. There's an auto top-up feature that will make sure you always have money available to pay for stuff, too. The app is also where you can suspend your ring if it goes missing to stop someone from spending away your hard earned cash. Away from payments, the company plans to introduce new features, some of which appeared on its NFC Ring. So you'll soon be able to use the ring to unlock cars, your home, replace passwords and better manage your financial affairs. In terms of design, the ring comes in either white or black and is made from scratch resistant and waterproof hypoallergenic ceramic. The good news is that it doesn't need charging at all. And if paying for stuff from your finger appeals to you, the McLear smart ring is available to buy in the UK now for £129. It'll also be launching in the US in late 2019 and then Japan in 2020. For sizing, you'll need to go to the company website, but it sounds like a solution to use your smartphone camera to assess the best fitting is in the works. 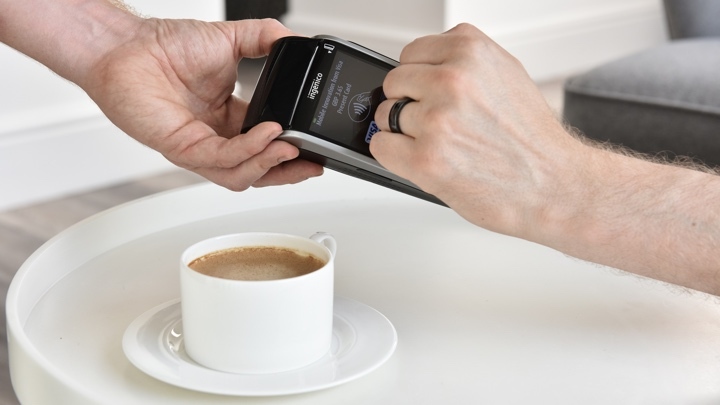 We've already been spending (ahem) some time with the smart payment ring and it appears to work well generally, although we have encountered a couple of issues using it with self-service tills. We'll have our verdict in the coming weeks, and whether we think this is the killer feature that will truly put smart rings on the map. Where's the update? I'm considering this, the only thing putting me off is having to load it with cash, rather than it just linking to an account or credit card like my phone does.